Is your basing system designed for Ga Pa, or have you adapted it from some other system? Could you please share your base sizes for foot and horse? Could your basing system be adapted easily enough (for Ga Pa) to produce 8 man bases instead of 6? So squadrons would be 8 men, and battalions would be 24 men…with slightly wider bases? Or would this cause problems with the game? I thought I’d come across an explanation of your rationale somewhere, but can’t find it now. sorry I missed your comment until just now. My basing works for Ga Pa because I provide the units for both sides :-). You can make lots of things work that way. My infantry are two sizes – the deeper foot (French and others who haven’t spread out for platoon firing) are 18 man units in two ranks, 180mm wide. The Dutch are 24 man units in two ranks, 240mm wide. I use 60mm wide bases, 40mm deep, and put 6 figures on them, then use 3 stands for the deep guys and 4 for the wide guys. My cav are all the same – each squadron is 6 figures on an 80mm wide base, 120mm deep. I chose these sizes for two reasons. The first is aesthetics. I like the look of two deep units, both infantry and cav, and that is the width on which things could fit comfortably with Front Rank figures. Second is it corresponds roughly to historical deployment widths. I think I did write it down somewhere at one point and also can’t find it. But another website has a description: http://www.spanishsuccession.nl/deployment.html. I think you could adapt to 8 man squadrons and 24 man battalions with ease. I believe Ga Pa uses base widths as its unit of measure, so however wide your 8 man stand would be for the foot would be your base width. I haven’t had any problems with my cav sizes for Ga Pa. Thanks for that. The link you provided is very useful. I’m more familiar with SYW unit sizes and frontages, but it looks as if things were quite similar for the WSS. I’ve found that for the SYW, 2 cavalry squadrons (150 men each) would occupy 80-100% of the frontage of an infantry battalion (approx 600 men in 3 ranks). My current aim is to use foot battalions of 5 bases of 6 men per base in 2 ranks. So 30 man battalions with a frontage of 27.5 cm (5.5 cm per base). Cavalry regiments would be of 2 squadrons (for ease), each of 4 bases of 2 men per base in 2 ranks. So 16 man regiments with a frontage of 22cm = 80% frontage of infantry battalion. With this system I get the approx correct ratio of infantrymen numbers vs horsemen numbers, as well as approx the correct frontages. And it should look fine indeed. Hopefully it will work with Ga Pa! If not, I can use Honours of War with the WSS mod, or Black Powder or similar. Thanks again for your reply – very useful!!! It’s been quite a long wait but I am delighted ypur posting here again. superb units and highly Inspirational. Thanks. My motivation for this has picked up quite a lot. I just went down to the basement to put a coat of sealer on Rosen Allemand for the French cav. Sadly my airbrush was clogged and needed a cleaning, so it will have to wait a bit. I have finished the Danish Livgarden til Fods unit and have started on Danish Oldenborgske and Cologne Wolfskehl. Hopefully those will be added to the roster soon. Plus I’ve put flags on a lot of units. 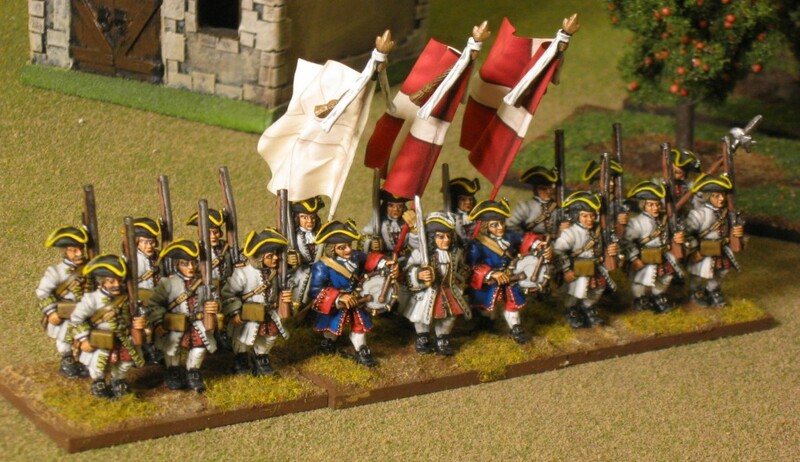 I’ve just about got all my Danish cuirassier flagged up. Amazing what a difference a small change like that makes.